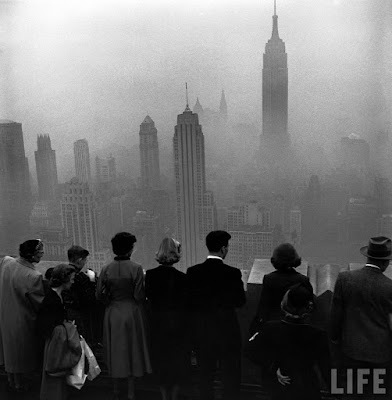 According the New York Times the next day, workers at the Empire State Building "alarmed by the roar of the engines, ran to the windows just in time to see the plane loom out of the gray mists that swathed the upper floors of the world's tallest office building." 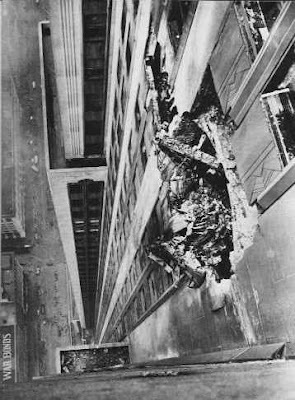 The crash not only damaged the Empire State Building (estimates at the time ran from $500,000 to $1 million in damages): one of the plane's engines actually shot through the building, tore a hole in the south side, and plummeted down onto the penthouse of 10 West 33rd Street, the studio of sculptor Henry Hering. The subsequent fire destroyed the studio. 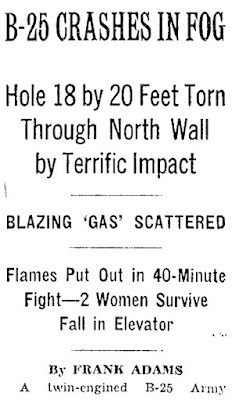 The other engine went into the elevator shaft, snapping the cable and driving the car -- with two women in it -- down to the basement; both women survived, one with severe burns. It is certain that Smith's visibility quickly worsened. With the fog growing thicker, Smith decided to fly lower to check his visibility; when he emerged from the clouds he found himself in Midtown Manhattan and somehow managed to fly about ten blocks, dodging skyscrapers, before ultimately hitting the Empire State. More about the Empire State Building -- and the aircraft originally designed to land on its towering spire -- can be found in Inside the Apple: A Streetwise History of New York City. On Sunday, August 16, at 5:00 p.m., we are returning to Lower Manhattan for another free walking tour of downtown sites. The tour will focus on famous sites in the Financial District connected to the Revolution and the early Federal period, including Fraunces Tavern--George Washington's last headquarters--and Federal Hall. 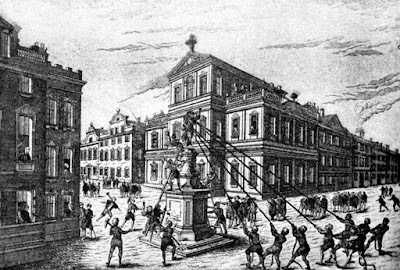 But we'll also talk about some lesser-known places, such as the sites of the second presidential mansion and the 1765 Stamp Acts protests when New York's governor was burned in effigy. The tour will begin and end at Borders at 100 Broadway; after the tour we'll have a Q&A. And, of course, copies of Inside the Apple will be available for sale and signing. No RSVP is necessary but please arrive a few minutes early so that we can start promptly at 5:00 p.m.
As the day began, many New Yorkers were surprised to hear the news from Mayor George Opdyke that not only had the draft been suspended but that the city council had voted the day before to authorize a fund to pay for a substitute for any New Yorker who was drafted and chose not to serve. The city had appropriated $2.5 million dollars for the cause--money it did not have and which surely would have bankrupted the city if spent. Opdyke promised that the riots were coming to an end and ordered people to go back to work and for the street car lines to resume running. A third letter also appeared in the press: an appeal from Catholic Archbishop Hughes to his flock urging them to come to his home on Friday to hear him in person. What only a few people knew was that the military had begun to arrive from Gettysburg. The Seventy-Fourth Regiment arrived soon after midnight on Wednesday and by the end of Thursday, the Seventh ("Silk Stocking") Regiment, the Sixty-Fith Regiment and others had been stationed at points around the city. 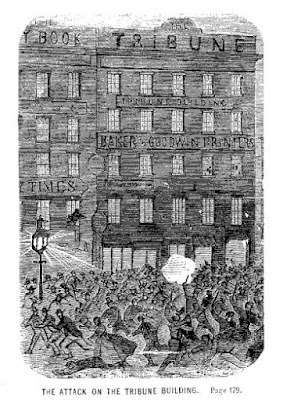 The arrival of more troops did not instantly quell the riots: there was a bloody clash between about twenty-five soldiers and a crowd that chased them into a foundry on First Avenue. But by the end of the day--as a rainstorm tore through the city, naturally discouraging the mob--it seemed as if the riots were on the verge of burning themselves out. They were on the whole a peaceable-looking crowd, and it was evidently composed chiefly, if not wholly, of those who had taken no part in the riot. None of the bloody heads and gashed faces, of which there were so many at that moment in the city, appeared. The address was well enough, but it came too late to be of any service. It might have saved many lives and much destruction, had it been delivered two days before, but now it was like the bombardment of a fortress after it had surrendered--a mere waste of ammunition. The fight was over, and to use his own not very refined illustration, he "spak' too late." There were no further outbreaks of violence that day and none the next day, Saturday, despite the news from Washington that the draft would be enforced and would recommence as soon as the city was ready. No one is certain how many people died in the clash. At the time it was estimated to be 1,000 but the official death toll afterward was reduced to just 100 people. The true figure may never be known, but surely rests somewhere in between, making the Draft Riots the single worst civil disturbance in American history. 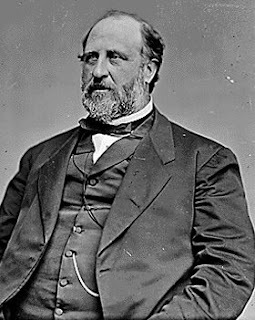 Democrats, led by rising Tammany Hall powerbroker William “Boss” Tweed, reached a compromise which allowed the draft to continue. Tweed would appoint a commission on behalf of the city to hear claims by those who felt they could neither serve nor pay the $300 and the city would decide to hire substitutes on a case-by-case basis. In the end, through a combination of city money, medical infirmity, and people simply not reporting for duty, only one person from Five Points served in the war because of the draft. 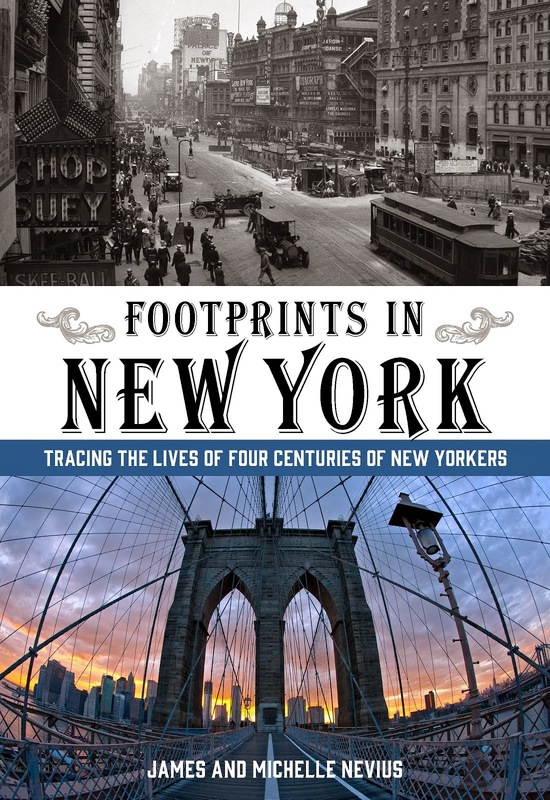 Read more about New York in the Civil War in Inside the Apple: A Streetwise History of New York City. 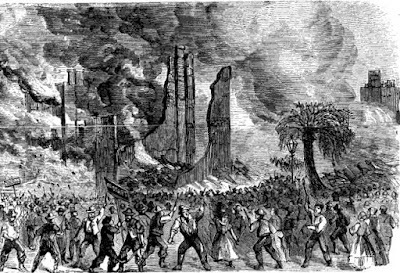 This is the third installment in our day-by-day remembrance of the Civil War Draft Riots, which gripped New York City from July 13-16, 1863. You can read about Day 1 here, and Day 2 here. Wednesday, July 15--the third day of rioting--proved to be the pivotal day in the confrontation. Had the rioters made more headway on Wednesday, the city could have fallen into utter anarchy and chaos. Instead, it was anarchy and chaos that worked in the favor of the beleaguered police officers and soldiers protecting the city. 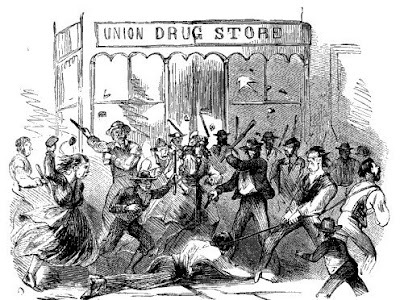 Each day the nameless "mob" spread out around Manhattan to destroy property and kill and injure black New Yorkers, but because the rioters had no real leaders and no thought-out plan, most mob actions were short lived. Like so many explosions, they burned bright, caused a lot of damage, and soon fizzled out. Wednesday dawned hot. Many New Yorkers, fearing the city was about to fall to the rioters, spent the day trying to get out of town, clogging the Hudson and East River piers and flooding north out of the city toward the Bronx and Westchester County. The police, many of whom had barely slept in 48 hours, tried to keep pace with the rioters. The police headquarters on Mulberry Street was connected via telegraph to the precincts for instant communication. Throughout the riots, police repair crews were constantly working on the telegraph lines in a vain attempt to keep information flowing in and out of the central command post, which was run by Police Commissioner Thomas Acton. "Go on, boys! Go on! Give it to them, now! Quail on toast for every man of you, as soon as the mob is put down. Quail on toast, boys!" At about two o'clock in the afternoon word was received that a large number of muskets were secreted in a store on Broadway, near Thirty-third Street; and Colonel Meyer was ordered to proceed thither, with thirty-three soldiers belonging to Hawkins' Zouaves, and take possession of them. Reaching the place, he found a large mob gathered, which was momentarily increasing. He, however, succeeded in entering the building, and brought out the arms. An Irishman happening to pass by in his cart, the colonel seized it, and pitching in the guns, closed around it, and moved off. No sooner did the detachment make its appearance and undertake its appointed task than it was assailed by a dense mob in front, and by showers of missiles from the houses, including a brisk discharge of pistols and musketry. The fire from the mob in front instantly betrayed something like organization, for it was by volleys, given at the word of command. Here, at least, the rioters went into action under competent leadership, such as might have secured successes for them at many other points. Colonel Winslow and his men stood their ground courageously….Ten rapid rounds of grape and canister tore through the masses of the mob and hurtled along the wide avenue. The slaughter was horrible, and the ground was momentarily cleared; but not so were the buildings on either side. The actual number of killed and wounded cannot be estimated with any accuracy, but there were rows of bodies on the pavement for about two "blocks." The fire from the houses grew hotter, and Colonel Winslow saw that he must retire…. Every tenth man of the entire command was down, and others were falling fast, not to mention those who were disabled more or less by minor hurts. It was literally "decimated," and more than that, before it could escape. The military made good the retreat, and the mob was left in triumphant possession of the battle-ground. Putnam immediately charged on the crowd in the street, scattering them like a whirlwind. He then turned his guns on the buildings, and opened such a deadly fire on them that they were soon cleared. Having restored order, he halted his command, and remained on the ground till half-past twelve. What most of those fighting did not know was that reinforcements were on the way. Late on Tuesday, Mayor Opdyke had telegraphed Secretary of War Edwin Stanton in Washington requesting that New York's militia companies--fresh from winning the Battle of Gettysburg--be sent to the city to quell the riots. As the violence calmed for the night on Wednesday, those militia companies were fast approaching the city. By daybreak, they would be on Manhattan and the riots would soon be over. Tomorrow: our final installment about the draft riot's final hours. But before we can get to the events of July 14, there was one final event on the first day of the riots that stretched through the evening into the second day: the attack on Horace Greeley's Tribune. Throughout the day, Greeley and his managing editor, Sidney Gay, argued about whether or not to arm themselves. Greeley was adamantly opposed and when he was then urged to leave the Tribune's offices on Newspaper Row, he is said to have replied: "If I can't eat my dinner when I'm hungry, my life isn't worth anything to me." All day long a crowd had been gathering in the Park around the City Hall, growing more restless as night came on. The railroad-cars [ED: streetcars] passing it were searched, to see if any negroes were on board, while eyes glowered savagely on the Tribune building…. [T]he Park and Printing-house Square* were black with men, who, as the darkness increased, grew more restless; and "Down with it! burn it!" mingled with oaths and curses, were heard on every side. At last came the crash of a window, as a stone went through it. Another and another followed, when suddenly a reinforcing crowd came rushing down Chatham Street*. This was the signal for a general assault, and, with shouts, the rabble poured into the lower part of the building, and began to destroy everything within reach. Captain Warlow, of the First Precinct, No. 29 Broad Street [joined forces with] Captain Thorne, of the City Hall [Precinct]….. Everything being ready, the order to "Charge" was given, and the entire force, perhaps a hundred and fifty strong, fell in one solid mass on the mob, knocking men over right and left, and laying heads open at every blow. The panic-stricken crowd fled up Chatham Street, across the Park, and down Spruce and Frankfort Streets, punished terribly at every step. The space around the building being cleared, a portion of the police rushed inside, where the work of destruction was going on. The sight of the blue-coats in their midst, with their uplifted clubs, took the rioters by surprise, and they rushed frantically for the doors and windows, and escaped the best way they could. This ended the heavy fighting of the day, though minor disturbances occurred at various points during the evening. 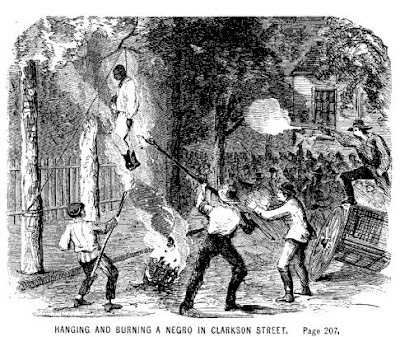 Negroes had been hunted down all day, as though they were so many wild beasts, and one, after dark, was caught, and after being severely beaten and hanged to a tree, left suspended there till [Police Commissioner] Acton sent a force to take the body down. Many had sought refuge in police-stations and elsewhere, and all were filled with terror. is today's Park Row, across from City Hall Park. The pillaging of entire black neighborhoods that had begun the previous night continued on Tuesday. On Sullivan and Roosevelt Streets**, where blacks lived in great numbers, boardinghouses, a grocery, and a babershop burned down since they either were owned by blacks or catered to them. Some blacks were chased all the way to the rivers and off the ends of piers. ** Roosevelt Street ran where the Brooklyn Bridge now stands. New York's governor, Horatio Seymour, arrived in the city that day and called for calm, but to little effect. Seymour, an anti-war Democrat, met with other high-ranking Democrats at the St. Nicholas Hotel on Broadway to determine the best course of action. What he did not do was to call on federal officials to declare martial law. While state militia troops were augmenting the police force, the federal army in New York was tasked solely with guarding military and federal installations, such as the custom house on Wall Street and Castle Clinton in Battery Park. [S]oon from the crowd arose shouts, amid which were heard the shrill voices of women, crying, "Break open the store." This was full of choice goods, and contained clothing enough to keep the mob supplied for years. As the shouts increased, those behind began to push forward those in front, till the vast multitude swung heavily towards the three police officers. Seeing this movement, the latter advanced with their clubs to keep them back. At this, the shouts and yells redoubled, and the crowd rushed forward, crushing down the officers by mere weight. They fought gallantly for a few minutes; but, overborne by numbers, they soon became nearly helpless, and were terribly beaten and wounded, and with the utmost exertions were barely able to escape, and make their way back to the station. The mob now had it all its own way, and rushing against the doors, burst bolts and bars asunder, and streamed in. But it was dark as midnight inside, and they could not distinguish one thing from another; not even the passage-ways to the upper rooms of the building, which was five stories high. They therefore lighted the gas, and broke out the windows. In a few minutes the vast edifice was a blaze of light, looking more brilliant from the midnight blackness that surrounded it. As the second day of the riots ended and the body count grew, the great unanswered question that hung in the air was: would tomorrow be better--or worse? We'll be back tomorrow with the third day of the Civil War Draft Riots. Today marks the anniversary of the beginning of the deadliest civil disturbance in American history: the Civil War Draft riots, which gripped the city from July 13 to 17, 1863. 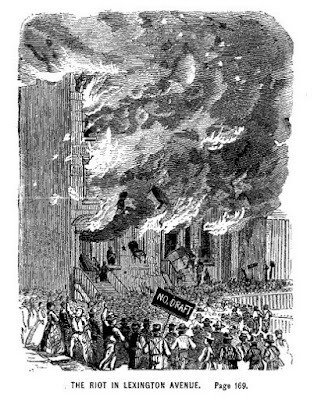 As the name implies, the riots broke out over the Union's decision to institute a draft. Desperate for both soldiers and money, the government decided on a two-pronged approach: those whose names were called could either choose to serve or they could get out of service by paying $300 for a substitute. Instantly people began to complain that the Civil War had turned into a "rich man's war and a poor man's fight," and as the July date of the draft approached, those New Yorkers who could little afford to pay $300--for some people that was a year's salary--talked about taking matters into their own hands. Early in the morning men began to assemble here in separate groups, as if in accordance with a previous arrangement, and at last moved quietly north along the various avenues. Women, also, like camp followers, took the same direction in crowds. They were thus divided into separate gangs…armed with sticks, and clubs, and every conceivable weapon they could lay hands on, they moved north towards some point which had evidently been selected as a place of rendezvous. This proved to be a vacant lot near Central Park, and soon the living streams began to flow into it, and a more wild, savage, and heterogeneous-looking mass could not be imagined. After a short consultation they again took up the line of march, and in two separate bodies, moved down Fifth and Sixth Avenues, until they reached Forty-sixth and Forty-seventh Streets, when they turned directly east. A ragged, coatless, heterogeneously weaponed army, it heaved tumultuously along toward Third Avenue. Tearing down the telegraph poles as it crossed the Harlem & New Haven Railroad track, it surged angrily up around the building where the drafting was going on. The small squad of police stationed there to repress disorder looked on bewildered, feeling they were powerless in the presence of such a host. Soon a stone went crashing through a window, which was the signal for a general assault on the doors. These giving way before the immense pressure, the foremost rushed in, followed by shouts and yells from those behind, and began to break up the furniture. The drafting officers, in an adjoining room, alarmed, fled precipitately through the rear of the building. The mob seized the wheel in which were the names, and what books, papers, and lists were left, and tore them up, and scattered them in every direction. A safe stood on one side, which was supposed to contain important papers, and on this they fell with clubs and stones, but in vain. Enraged at being thwarted, they set fire to the building, and hurried out of it. As the smoke began to ascend, the onlooking multitude without sent up a loud cheer. Though the upper part of the building was occupied by families, the rioters, thinking that the officers were concealed there, rained stones and brick-bats against the windows, sending terror into the hearts of the inmates. As the day progressed, the mob grew in size and factions fanned out across the city. In bloody conflicts with the police, numerous officers were wounded including Police Superintendent Kennedy who was beaten and left for dead. Another target was the homes of wealthy Republicans and a string of houses along Lexington Avenue were set on fire and looted. [I]mpelled by a strange logic, [the rioters] sought to destroy the Colored Orphan Asylum…. There would have been no draft but for the war—there would have been no war but for slavery. But the slaves were black, ergo, all blacks are responsible for the war. This seemed to be the logic of the mob, and having reached the sage conclusion to which it conducted, they did not stop to consider how poor helpless orphans could be held responsible, but proceeded at once to wreak their vengeance on them. The building was four stories high, and besides the matrons and officers, contained over two hundred children, from mere infants up to twelve years of age. Around this building the rioters gathered with loud cries and oaths, sending terror into the hearts of the inmates. Superintendent William E. Davis hurriedly fastened the doors; but knowing they would furnish but a momentary resistance to the armed multitude, he, with others, collected hastily the terrified children, and carrying some in their arms, and leading others, hurried them in a confused crowd out at the rear of the building, just as the ruffians effected an entrance in front. Then the work of pillage commenced, and everything carried off that could be, even to the dresses and trinkets of the children, while heavy furniture was smashed and chopped up in the blind desire of destruction. Not satisfied with this, they piled the fragments in the different rooms, and set fire to them. The orphanage was burned around 4:00 p.m., about the same time that another group decided to attack the home of Mayor Opdyke and as a third group began heading toward Newspaper Row (today's Park Row) to take out their vengeance on Republican newspapers like Horace Greeley's Tribune. But that's where we'll continue the story tomorrow. Today marks the anniversary of the beginning of the end of the notorious Tweed Ring and its leader, Tammany Hall boss William M. Tweed. On July 8, 1871, the New York Times led with a story headlined "MORE RING VILLIANY." While this wasn't the first time the paper had railed against Tweed and Tammany politics, it was the first time they were able to back up their allegations with proof. Tweed is still one of the best-known names from 19th-century New York; but as we note in Inside the Apple: A Streetwise History of New York City, his actual period in power was relatively brief. 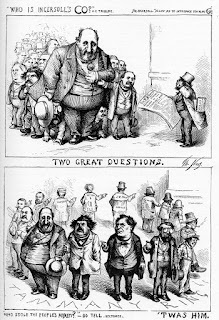 Though he served as an alderman and member of the U.S. congress in the 1850s, Tweed's stranglehold on New York politics really began in the aftermath of the Civil War Draft Riots of 1863 (a topic we'll tackle in another post). Over the next decade, Tweed turned New York into his own personal cash register, skimming money from building projects and, as the Times article points out, collecting exorbitant rents for National Guard armories--some of which didn't even exist. 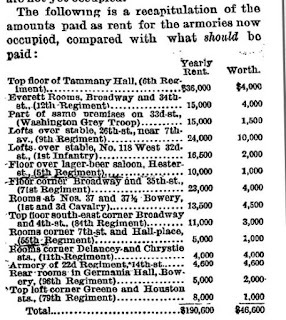 The article's subhead laid out the basic details: "Exorbitant prices given for regimental headquarters--stable lofts at a premium--thousands of dollars paid for bare walls and unoccupied rooms. Over eighty percent of the money stolen." Over the course of the next two pages, the article spells out precisely how Tweed and his cronies were bilking the city. The Sixth Regiment, for example, rented an almost unusably small drill hall on the second floor of Tammany Hall's headquarters. While the Times notes that such a space might fetch $3,000 on the open market, the treasurer of Tammany Hall instead was paid by the city $86,000 a year--the assumption being that the money then wended its way into the pockets of Tammany Hall's leader, Tweed. Another armory, at 53 Chrystie Street, was being rented for the more reasonable sum of $5,000 a year. 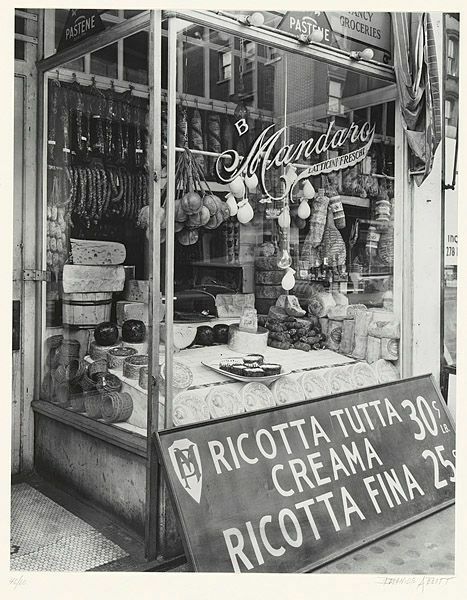 The only problem--there was no armory at 53 Chrystie Street, just the rear entrance to a store owned by Tweed's business partner James H. Ingersoll. Indeed, a thorough examination of the books showed that most of the rents paid out by the city somehow ended up in Ingersoll's account. For the next three months, the Times -- and Harper's Weekly cartoonist Thomas Nast -- pursued Tweed relentlessly. He was arrested in October 1871 and put on trial in 1873. He was convicted, sent to prison, released, re-imprisoned, escaped.... well, it's a long story. We'll blog more about it future posts and you can, of course, read all about it in Inside the Apple. Though there is still a Tammany Hall headquarters building on Union Square, it isn't the one where Boss Tweed presided (or that rented out space to the Sixth Regiment), pictured above. The best place to go and see Tweed's legacy is the Tweed Courthouse on Chambers Street between Centre Street and Broadway. Today the headquarters of the Board of Education, the Tweed Courthouse was one of the most expensive buildings constructed in 19th-century New York. As we approach the Fourth of July weekend, we thought it might be a good opportunity to remember that America actually declared its independence from Great Britain today, July 2nd. "The second day of July, 1776, will be the most memorable epoch in the history of America. I am apt to believe that it will be celebrated by succeeding generations as the great anniversary festival." Well, he was only off by two days. In fact, only twleve of the thirteen original colonies had voted to declare independence on July 2 -- the delegates from the thirteenth colony, New York, did not feel they had been invested with such power and retreated from Philadelphia to discuss their options. Meanwhile, on July 4, the Continental Congress agreed to print the Declaration. Scholars guess that somewhere between 100 and 200 of these Dunlap Broadsides, as they've come to be known, were printed that evening*, probably under the watchful eye of Thomas Jefferson, the Declaration's lead author. 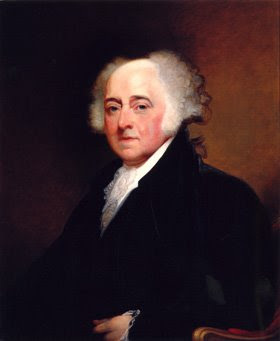 On July 5 and 6, John Hancock had riders dispatch Dunlap broadsides to colonial cities and on July 9 a copy arrived in New York City, where George Washington's troops were stationed. That same day, New York agreed to be the thirteenth and final colony to declare independence. (Good thing, since the printed Declaration begins, "The unanimous declaration of the thirteen united states of America.") That night, American troops and the Sons of Liberty tore down the gilded statue of George III in Bowling Green Park, signaling New York's new life as an independent American city. So, what all this really means is that the we shouldn't celebrate Independence Day, but rather Independence Week from July 2 - July 9. Have fun! * 25 Dunlap Broadsides are known to exist today.